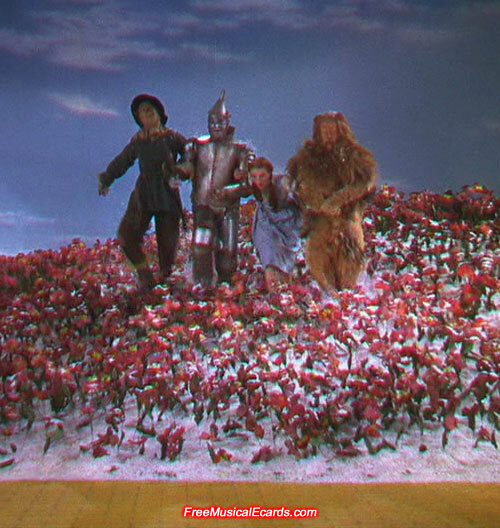 The Wizard of Oz beauty, Judy Garland accidentally tripped over during filming. 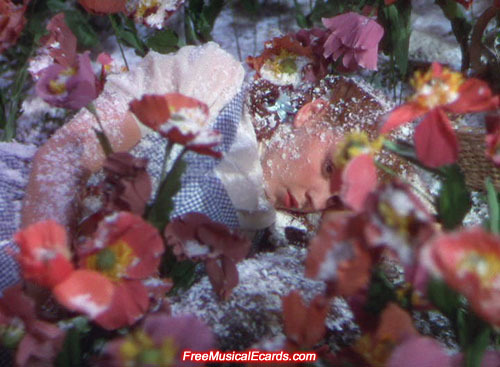 It happened when she (Dorothy) and her companions came out of the poppy fields after it had snowed. 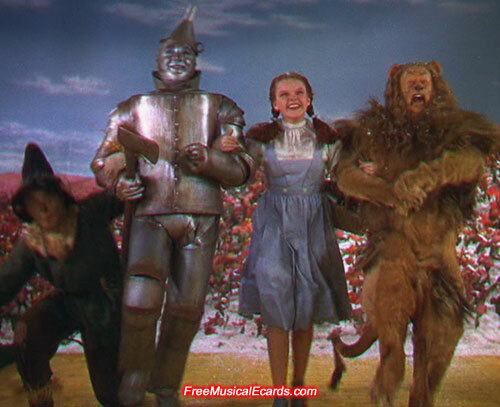 Luckily she was holding onto the Tin Man and Lion, otherwise she could have fell over and maybe hurt herself. 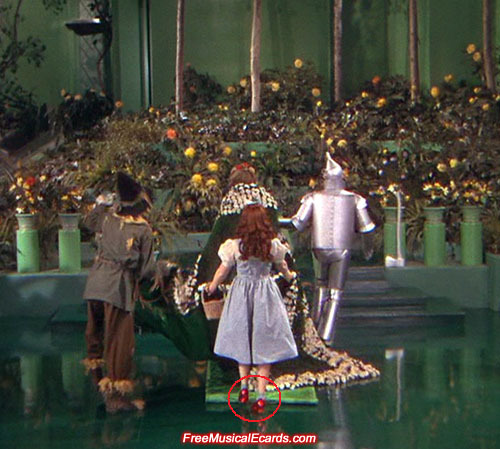 MGM decided not to reshoot the scene, even though the scene clearly shows Dorothy bending forward after stepping into a hole in the ground (pictures below). There was a similar incident when Lion was singing while they waited outside the Wizard's palace. 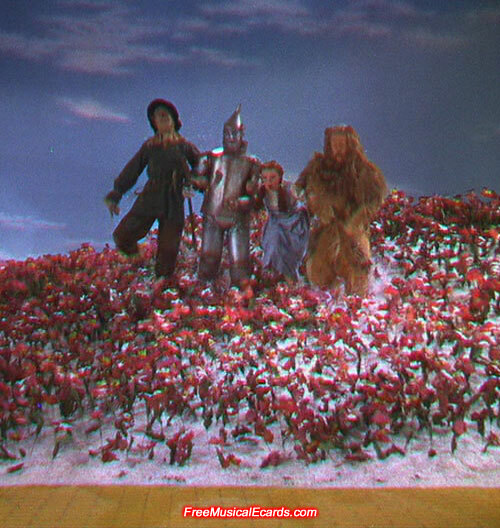 During this scene, Dorothy nearly tripped from the carpet/rug which is quite hilarious too. Rare behind-the-scenes photo of Judy Garland as Dorothy and her three traveling companions listening to director Victor Fleming giving instructions in the Poppy Field scene, while a stagehand holds her dog Toto. A very rare behind-the-scenes photo of Judy Garland as Dorothy with her eyes open and preparing to sleep in the Poppy Field scene. Lights, Camera, Action! 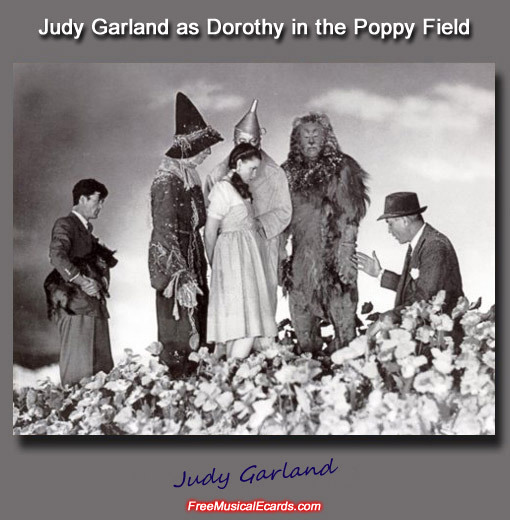 The Wicked Witch casts a magic spell which causes Judy Garland as Dorothy to fall asleep in the Poppy Field. The snow used was not real but artificial snow sprayed with pure chrysotile asbestos fibers. These substances are hazardous to health because once breathed in, they may get trapped in the lungs. 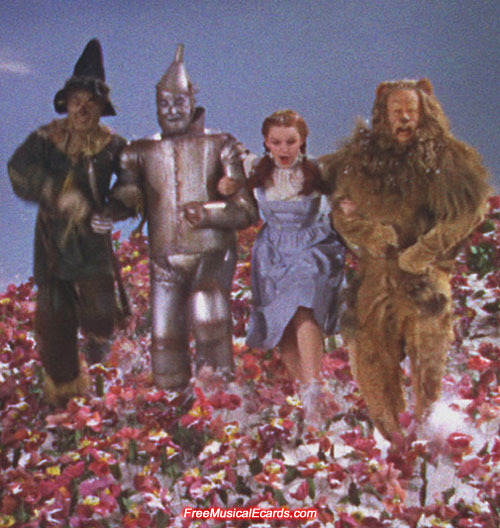 Judy Garland as Dorothy gets her left foot caught in the rug, and she lifted her right foot high to avoid tripping. 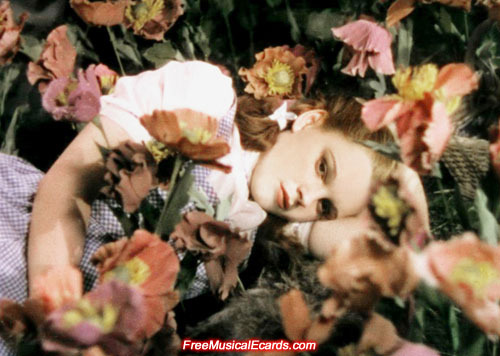 to be so high on Judy Garland. By the way, I did not suggested that in a bad way. I've watched The Wizard of Oz many, many times. It's difficult to give an estimate in figures. When I was young, I watched The Wizard of Oz for entertainment purposes but nowadays I watch it to specifically study all the details, you are right. I know nearly everything about movie, things like the actor's lines, the mistakes that are not clear to the naked eye, how they produced each scene such as the snow and tornado. 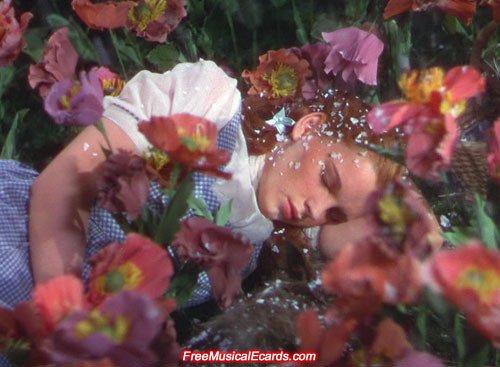 I even know what Judy Garland was doing when she was not filming, and the exact day they filmed each scene. For example the Haunted Forest was filmed on 6th of January, 1939. I enjoy studying the history of Judy Garland, she is the ultimate icon. Wow..that's amazing and kudos to you. If you love what you like doing hey why not put all your heart and soul into it right? 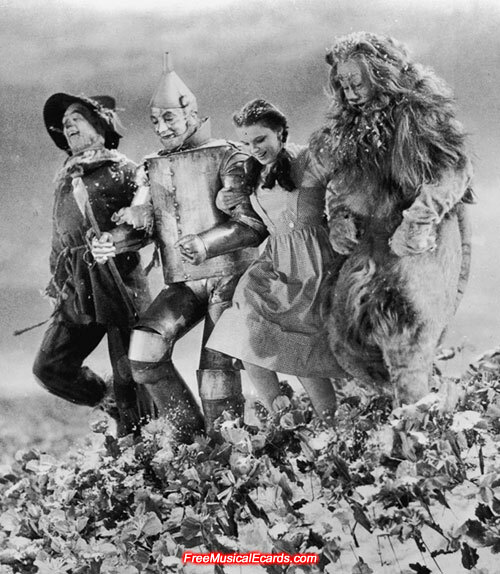 The OZ movie was probably one of the most inspiring idea for folks to look up to when the country was still experiencing the Great Depression the 1920's and 1930's. 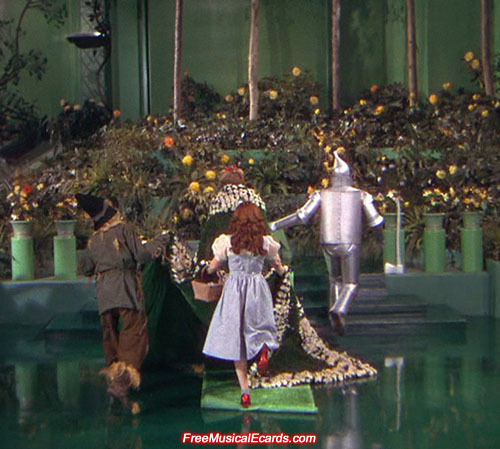 Just like you stated previously, the Oz movie will always be part of Americana. Perhaps you can create a 'Wizard of Oz' festival in Vientaine in the near future? That idea came across my mind but then I realise that no one in Laos gives a hoot about The Wizard of Oz movie, let alone a Wizard of Oz festival. It's not feasible and it's not going to get local support. If you want to create a festival in Laos, it has to be Lao-related. Very true. Only die-hard Judy Garland fans will come to the event. Is it fair to say that you are the only one in Vientaine that's into Judy Garland? Maybe more out there? Just being curious. I know a few people who are into Judy Garland. My mum, who is Lao, also likes her. A ceremony is probably more appropriate than a festival. Even though Judy Garland wasn't a Buddhist, you can still organise a Buddhist ceremony in memory of her. In Lao culture, the belief is that your offerings such as gifts, money and foods to the monks are passed to the departed one. The ceremony doesn't have to be dedicated to one person, but also to others whom you really care about. Holy what? Holy is an adjective. As far as I can recalled I may have involved two times in this Buddhist ceremony when I was much younger. So the gift offerings would be donated to the Temple or lesser individuals in Judy Garland's honour? Your offerings goes towards the temple in Judy Garland's honour.